His comments were prompted by a Times article describing the same phenomenon for small dairy farmers in upstate New York. Morse, America’s Farms Need Immigrants, N.Y. Times (Mar. 21, 2019). Goldbaum, Trump Crackdown Unnerves Immigrants, and the Farmers Who Rely on Them, N.Y. Times (Mar. 18, 2019). See also the posts listed in “U.S. Population & Immigration“ section of List of Posts to dwkcommentaries—Topical: United States (POLITICS). More Immigrants Needed in U.S. Previous posts have pointed out the U.S. need for more immigrants, in the opinion of this blogger. This conclusion follows from the U.S. declining birth rate, the aging, declining population of the rural parts of many states and the current low unemployment rates and the difficulties many companies are facing in finding additional workers. Then Stephens adds a sixth, and more controversial, reason: “immigrants — legal or otherwise — make better citizens than native-born Americans. More entrepreneurial. More church-going. Less likely to have kids out of wedlock. Far less likely to commit crime.” This reason is supported by (a) a 2015 National Academy of Sciences study that concluded that “immigrants are . . . much less likely than natives to commit crimes;” (b) a 2017 Cato Institute report that 0.85 percent of undocumented immigrants are incarcerated compared with 1.53 percent of native-born Americans; and (c) a 2018 Marshall Project analysis of 200 metropolitan areas in the U.S. with falling crime while their immigrant population was increasing. This change was associated with deaths exceeding births among white people in more than half of the states in the country. 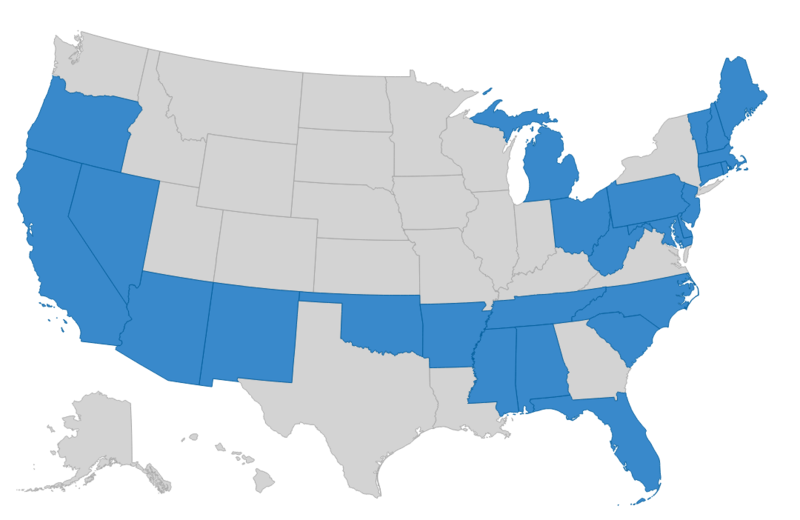 Here is a map of the U.S. with states in blue having more white deaths than births in 2016. The Census Bureau had been projecting “that whites could drop below 50 percent of the population around 2045, a relatively slow-moving change that has been years in the making.” But this new report leads some demographers to say that shift might come even sooner. Some political observers believe this current and future demographic change was a potent issue in the 2016 presidential election that helped drive many white voters to support Donald Trump. These demographic changes and challenges are not unique to the U.S. An article in the New York Times “states, “Immigration is reshaping societies around the globe. Barriers erected by wealthier nations have been unable to keep out those from the global South — typically poor, and often desperate — who come searching for work and a better life. While immigrants have often delivered economic benefits to the countries taking them in, they have also shaken the prevailing order and upended the politics of the industrialized world — where the native-born often exaggerate both their numbers and their needs.” Their article has many amazing global maps regarding immigration flows. It is easy to understand why many people fear these changes in the makeup of their communities and seek political answers that purportedly will stop these changes. Those of us who do not share this fear need to develop a message that emphasizes the constancy of change in human life on this planet, that these changes will have positive effects on life in the U.S. and that we as a society can cope with any negative effects. Another element in this effort should be emphasizing the well-established fact that in any large group of people—be they immigrants or Republicans or Democrats or business executives or farmers—there will be a few “bad apples.” But the “bad apples” should not define the group as a whole. The American people at large get this point as a recent public opinion poll indicated that 75% of them believe immigration generally is good for the nation. We also have to battle against the vile rhetoric of Donald Trump, who just this week said his hardline stance on immigration was aimed at stopping the “death and destruction caused by people that [sic] shouldn’t be here.” He emphasized this point by having with him “angel families,” who are relatives of people who had been killed by undocumented aliens and who talked about their legitimate grief over loss of loved ones. Stephens, Our Real Immigration Problem, N.Y. Times (June 21, 2018). Rogers, Trump, Defending Immigration Policy, Laments Deaths Caused by People Who ‘Shouldn’t Be Here,’ N.Y. Times (June 22, 2018). Adamy & Overberg, Growth in Retiring Baby Boomers Strains U.S. Entitlement Programs, W.S.J. (June 21, 2018). Tavernise, Fewer Births Than Deaths Among Whites in Majority of U.S. States, N.Y. Times (June 20, 2018); Sáenz & Johnson, White deaths Exceed births in a Majority of U.S. States, Applied Population Lab, UW-Madison (June 18, 2018). The graph’s source: Analysis of National Center for Health Statistics data by Rogelio Sáenz, University of Texas at San Antonio, and Kenneth M. Johnson, University of New Hampshire. Krugman, Return of the Blood Libel, N.Y. Times (June 21, 2018). Porter & Russell, Immigration Myths and Global Realities, N.Y. Times (June 20, 2018). Chokshi, 75 Percent of Americans Say Immigration Is Good for Country, Poll Finds, N.Y. Times (June 23, 2018); Brenan, Record-High 75% of Americans Say Immigration Is Good Thing, Gallup (June 21, 2018). Rash, Rash Report: The migration issue is global, and growing, StarTribune (June 22, 2018). See also Prather, ‘Somalis + Minnesota’ exhibit opens Saturday at Minnesota History Center, StarTribune (June 22, 2018); Jones, “Somalis + Minnesota” at history museum, StarTribune (June 22, 2018) (photographs of exhibit). Posted on June 23, 2018 June 24, 2018 Categories Economics, PoliticsTags "Somalis + Minnesota", Bret Stephens, Cato Institute, Hmong immigrants, John Rash, Karen immigrants, Marshall Project, Minneapolis Federal Reserve Bank, Minnesota History Center, National Academy of Sciences, Neel Kashkari, New York Times, Paul Krugman, President Donald Trump, Rep. Ilhan Omar, Sen. Patricia Torres Ray, Somali immigrants, StarTribune, U.S. aging & declining population, U.S. Census Bureau, U.S. declining birth rate, U.S. immigration, U.S. low unemployment, Vietnamese immigrants, Wall Street Journal6 Comments on More Immigrants Needed in U.S.
“The most recent decline has been deepest for minorities. The fertility rate among Hispanic women dropped more than 27 percent between 2007 and 2016, the most recent year of data by race. The rate for whites has dropped about 4 percent, for blacks about 11 percent and for Asians about 5 percent. Nat’l Ctr for Health Statistics, Births: Provisional Data for 2017 (May 17, 2018); Tavernise, Fertility Rate Fell to a Record Low, for a Second Straight Year, N.Y. Times (May 17, 2018). Editorial, Exporting Jobs Instead of Foods, W.S.J. (May 17, 2018) See also U.S. Needs More Immigrants, dwkcommentaries.com (April 14, 2018). Freeman, Trump and America’s Immigrant Shortage, W.S.J. (May 17, 2018). DePass, Minnesota manufacturers’ profits soar, but a labor shortage looms, StarTribune (May 18, 2018); Ramstad, Minnesota’s employers, with fewer people to hire, are hiring fewer, StarTribune (May 18, 2018).